The world’s first iron bridge was erected over the River Severn at Coalbrookdale in 1779. In 1986 the Ironbridge Gorge was one of the first locations to be designated as a World Heritage Site within the U.K. In 2017, a major conservation project began to repair the Iron Bridge, which is suffering due to stresses in the ironwork dating from the original construction, ground movement over the centuries and an earthquake at the end of the 19th century. Severn Trent Water have twin 6 inch cast iron mains, feeding Much Wenloch from Telford, running directly over the bridge. OnSite were awarded the scheme, via Amey, to remove the existing mains to enable the restoration work to begin. A team was mobilised in February 2017 and commenced phase 1 to cap off the 6 inch main on the eastern side of the bridge. This was completed and the team demobilised, allowing the removal of the existing main by Taziker Industrial who were undertaking the repairs. The team were mobilised again to commence phase 2 in May 2018 – to install a new 160mm MDPE main over the restored eastern bridge deck. This was put into commission and the team demobilised. Once the eastern side of the bridge had been restored, the team were again mobilised in August for phase 3 – cap off the 6 inch cast main on the western side of the bridge. 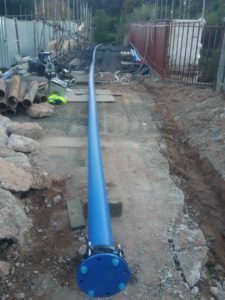 Due to the intensity of the hot spell of weather in Summer 2018, the team were instructed to lay an additional 125mm overland main to ensure the feed to Much Wenlock would remain. This was completed along with the cap off’s and the team demobilised. The team returned in October 2018, on completion of the restoration of the western side of the bridge, to commence phase 4. 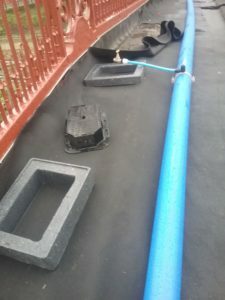 A secondary 160mm MDPE main was laid over the bridge and put into commission. They removed the temporary 125mm overland main and demobilised succesfully completing this scheme.